Welcome to Ertoel - The most "user friendly" hand spinner ever made. Perfected over 38 years of production. This “Denise” Electric Carder has a drum at the rear, to act as a “worker”, making 3 drums in all. The overall dimensions are 71cm long, 31cm high and 46cm wide, quite suitable for household tabletop use. Ideal for spinning and weaving guilds, or for operating a fibre cottage industry. Drums are 20cm wide, creating a batt size 63cm long by 20cm wide by 12mm deep (compressed depth). Card cloth is a lasting robust type. The wires are deep, giving a good output of batt volume with every use. Excellent to handle wool, mohair and alpaca. Fibre can be washed, or unwashed of grease. The wool (or any other animal fibre) is fed through the opening of the clear acrylic window with the cover down. When the main drum is full, the cover (hinged at the back) lifts up and back, for easy access for the batt removal. The carding process builds up a deep batt on the 15cm diameter main drum (the swift). When it is full, the batt of fibre needs to be lifted off, as occurs with hand drum carders. A doffer implement is provided. The whole assembly is driven by ¼ horsepower single-phase motor. Can be plugged into any household power point. It has a long-lasting robust motor, using no more power than 4 light bulbs. Safe to use. If the machine jams, the driving belt slips on the motor pulley. The extended feed tray has a lower storage slot, to enable it to slide right in, for compact storage of the whole machine. Strong, simple construction means it will last many years of hard work. It comes with a 12 month warranty. The “Denise” Electric Carder is a well proven carder. Our Electric Carder has been in continuous production for over 34 years (2018). Robustly built to last a lifetime of use. Long lasting card cloth (or card wire). The greatest depth of batt possible (half inch deep compressed on the drum). Can be easily dismantled, should any fibre get caught around shafts because of misuse. Suitable for all fibre types. No need to make any drum adjustments. Factory set. Cannot get out of adjustment. 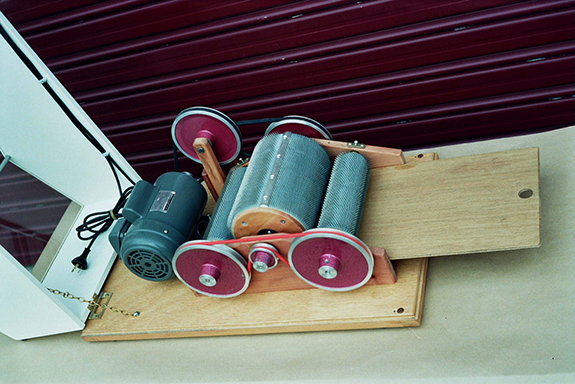 The batt yield on the electric “Denise" Electric Carder is 22 inches long by 8 inches wide by half an inch deep (when the batt is compressed). The Roberta Electronic Spinner and the "Denise" Electric Carder make an excellent pair, for any fibre cottage industry. They will pay for themselves in a relatively short time. The electric carder is so quick, compared to a hand drum carder, and of course no arm work needed. The electric carder is suitable for any type of animal fibres. Many alpaca farmers purchase the electric carder. All equipment is made to order. To get a “Denise” Electric Carder, about 3 weeks. A $500 deposit at the time of ordering, is required for the electric carder. You can order by email. Cheque or credit cards are accepted. A cheque deposit should be written out to I.G. and D.A. Spark (not Ertoel Wheels). An online deposit is preferred. If you require this option, please let me know, and I will supply the banking information. Everything is robustly built to last, even for heavy commercial use. Phone me, if you want some personal advice about using the equipment. Phone (03) 9717 6196 (Australia) or +613 9717 6196 (International). We road freight these electric carders to any address in Australia, rural or urban. We can also ship to New Zealand. Please note that on the price list a reusable crate will be required, if it is to go interstate or to NZ. For the price list or any questions, contact us by email. There is the need to class the fibre for length, prior to carding. Mixing together, short and long fibre lengths, will not produce a good result in any mechanical drum carder. The reason is that long fibre moves more slowly onto the main drum, and is dragged down into the wires, as it is loaded on. Short fibre moves much quickly onto the main drum, and the fibre tends to sit high on the card wire of the main drum. These different lengths interfere with each other, so a good carding job is not accomplished. If the shorter fibre is also fluffy (because of the way it was washed), it makes this issue much worse, because the fibre will not sit down into the card wire of the main drum. As the main drum goes around again, this short fibre gets carded again by the feed drum, and in the process is often broken up even more. This interferes even further than before, with the longer fibre being carded properly. Second shear short pieces, can also have the same bad effect on a good carded job. If the classing of the fibre is at the longer end of the range of length, say 100mm (or 4 inches). The differential of all the lengths in the sample lot, can vary as much as 30mm, without any negative carding effects. However, if the average lengths of the sample lot were at the shorter end of the range, say 40mm (one & five eighth of an half inches), the differential of lengths can only be about 5mm different. This length rule is essential for good results. Nothing under 40mm in length should be considered (especially if it is also very fluffy fibre), as the fibre will not be long enough to draw down into the card wire of the main drum. Do not use fibre shorter than 40mm. It will not lay down on the main drum properly, and this will interfere with the new fibre coming in under the feed drum. In addition, this short fibre will get chopped up, creating even more trouble in the final result. Ideally the fibre should look as natural as possible, as a staple lot, prior to carding (even after washing). Choose a washing method that keeps the fibre looking natural in the staple lots. Very fluffy fibre going into the carder will likely to get ripped up, as the fibres are being straightened up onto the main drum. As much as is possible, feed in the fibre root end in first, having been hand opened, on the ends of the staple lot. Only if the fibre is of a good strong tensile strength, a bit of criss crossing of the fibres, can be tolerated, without a lot a breakage. Staple lots should never be fed in across the feed drum. This is just inviting the fibre to get broken up, and can make a very poor result in the final batt of fibre. It is mis-information that fine card wires are needed for fine fibres. We have been using a medium to coarse type wire on our carders for 44 years (2018). We have never had one complaint about the card wire not being suitable for fibres, like fine merino. The secret is to prepare and open the fibre more thoroughly, before submitting it to the carder. In the very worst situation, it may need a second carding. If that should be required, you separate the first batt of fibre into 4 strips, then feed in each strip in continuously, side by side, and one at a time. Using fine wire in a carder means the batt will yield less, and be greatly reduced, because of the less depth in the wires. The main problem using fine card wire (if it was available), is that the wires have to be short, otherwise they will wear out, bend and break. That means the yield per batt, will be greatly reduced.